Why Should I CARE About Maintaining My Septic System? Click play to hear a radio ad on septic systems! This Ad was played on 97.5 FM! Click here to watch a video on septic systems! The video was provided by Two Rivers Coalition! How Can I PROPERLY MAINTAIN My System? • The average septic system should be inspected at least every three years by a professional. • Limit excessive water usage in your home. • Protect your home’s drinking water for you and your family -NEVER flush hazardous materials into the system! • Expensive additives are not necessary and they do NOT eliminate the need for pumping! Can I Spot POTENTIAL PROBLEMS In MySeptic System? Michigan DEQ's List of Licensed Pumpers search by county! • Learn the location of your septic tank and drain-field from your septic company. • Have your septic system inspected every three years. • Call a professional whenever you experience problems. • Conserve water to avoid overloading the system. • Divert sources of water, like roof drains, house footing drains, and sump pumps away from the septic system. • Go down into a septic tank EVER. Toxic gases in the tank can kill in minutes. • Allow anyone to park or drive over the system. • Plant anything besides grass over or near the drain-field. • Dig in your drain-field or build anything over it. • Make or allow repairs without obtaining the required health department permit. To print a fact sheet for your community's news letter Click Here. Click to view presentation from the Berrien County Health Dept. 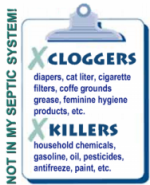 about septic systems! When is the last time you had your septic system pumped? Can't recall? Then it's been too long! Call today! Maintaing your septic system benefits the entire community by giving everyone access to clean, safe water resources. Click the billboard to become a Friend of the Galien on Facebook! See how a septic systems works! See how a septic tank works! Things not to put in your septic tank! Click to become a Friend of The Galien River on Facebook! Learn more about how your septic system operates, why it's important to properly maintain your system, simple, every-day tips that will help you avoid costly system repairs and replacement, and more!